Planning a trip to Richmond? Here’s some useful background information and introductory resources to ensure you have a great visit to British Columbia’s Pacific, authentic gateway city. You can also view our visitor guide here. Richmond has a population of approximately 200,000, with more than half its citizens of Asian descent. English and French are Canada’s official languages, but you’ll also find many Mandarin and Cantonese speakers here—and you’ll likely hear Japanese, Korean or other languages spoken throughout the area. Richmond is in the Pacific Time Zone, adhering to Daylight Savings Time. 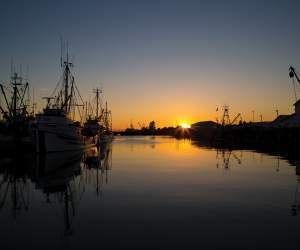 The city is on average one metre (approximately three feet) above sea level, and consists of 129 square kilometres (49.8 square miles) of land area spread across 17 islands in the Fraser River delta. Richmond enjoys a mild, coastal climate year-round. You can learn more about local weather here. Canada’s currency is the Canadian dollar, comprising dollars and cents. It’s advisable to have Canadian cash before arriving, but you can also exchange your money here at banks and currency outlets, including those located at Vancouver International Airport (YVR). ATMs are also widely available. Visa and Mastercard (and less often cards such as American Express) are widely accepted in Richmond. Additional payment options can range from debit cards to Apple Pay and Alipay. Payment options are found in the individual business listings on this website. Keep in mind that smaller businesses and restaurants may be cash-only. GST (federal goods and services tax) of 5% and PST (provincial sales tax) of 7% (or 8% for accommodation and 10% for alcohol) is frequently added to transactions at the point of payment. Richmond also has a 3% hotel room tax, which is added to your bill when you check out. It is customary to tip between 15% and 20% (before tax) at bars and restaurants. Tips of a similar level are often given to taxi drivers, tour guides and for haircuts or spa treatments. Airport and hotel porters often receive $1 or $2 per luggage item. Richmond stores, restaurants, attractions and hotels are committed to accessibility for those with mobility challenges. We also have a wide array of accessible transportation options. The Rick Hansen Foundation recently recognized Richmond with an Accessible Cities Award, one of only three Canadian cities to receive the accolade. From U.S. citizens to those needing international visas or Electronic Travel Authorizations (eTA), rules for entry into Canada vary by country, mode of transport and individual traveller. It’s essential to know exactly what documents you will need before planning your trip. Home to Canada’s second-busiest airport, around 30 minutes from U.S. border road crossings and just a short hop from provincial public ferry services, getting to Richmond couldn’t be easier. And if you’re coming from neighbouring Vancouver, we’re just a 20-minute rapid transit ride away. Canada’s second-busiest airport, Vancouver International Airport (YVR) serves more than 50 airlines and 22 million passengers every year. It has also been named by SkyTrax as the Best Airport in North America ten consecutive times! Dedicated to enhancing the smooth travel plans of all incoming and outgoing passengers, the airport has a host of trip-friendly features and services. Getting around Richmond is simple and efficient. We have an extensive and accessible public bus network plus the popular Canada Line rapid transit system, which links us to Vancouver International Airport (YVR) and Vancouver. We also have a full range of taxi, limousine, rental car and hotel shuttle services. Linking Richmond to Vancouver International Airport (YVR) and downtown Vancouver, the Canada Line rapid transit system is fast, convenient and cost-effective. And since we have seven Canada Line stations in our city, it’s also a great way to get around Richmond. Richmond is well connected to some of the region’s other popular destinations, making us an ideal base for visitors keen to explore the area. Vancouver—home to Stanley Park plus numerous museums and galleries—is only 20 minutes from us via direct Canada Line rapid transit ride. Skiing and snowboarding hotspot Whistler is just a two-hour scenic highway drive away. And historic Victoria—the Vancouver Island capital of British Columbia—can be reached via BC Ferries service from Delta, a 30-minute drive from Richmond. Non-medical cannabis use was legalized in Canada in October 2018. You must be at least 19 years of age to buy, possess or use cannabis in British Columbia. Also, it is a criminal offence to drive while impaired by any drug, cannabis included. The City of Richmond has chosen to prohibit the sale of cannabis within the city, which means you won’t find any storefronts selling these products here. Richmond’s smoking bylaws apply to all types of smoking, from tobacco to vaping to cannabis. In general, smoking of any type is prohibited in workplaces and other indoor areas used by the public, as well as customer service areas such as patios. Smoking is also not permitted at a wide range of public parks and public-use areas, including beaches, trails, playgrounds, golf courses, docks, piers, heritage sites, public recreation centres, and more. Located in Richmond, Vancouver International Airport (YVR) has its own cannabis-related rules. Click here for details. For comprehensive information on cannabis rules and usage in BC and the rest of Canada, visit GetCannabisClarity.ca. Make sure you are aware of the required travel documents you need prior to arriving in Canada! Richmond makes accessibility a priority for people with mobility challenges and disabilities. More than 50 airlines serve YVR, connecting people from over 120 destinations around the world. Richmond enjoys a mild, coastal climate year-round.